Capt. Benjamin Blanton U.S. Marine Corp. He Pilots the Lockheed Martin C-130 Hercules Cargo Plane Known as Fat Albert Airlines. Capt. Benjamin Blanton U.S. Marine Corp. He Pilots the Lockheed Martin C-130 Hercules Cargo Plane Known as Fat Albert Airlines. One of the most interesting people I met this year is Capt. Benjamin Blanton, U.S. Marine Corp, during the 2012 Florida International Air Show in Punta Gorda, Fla. Capt. 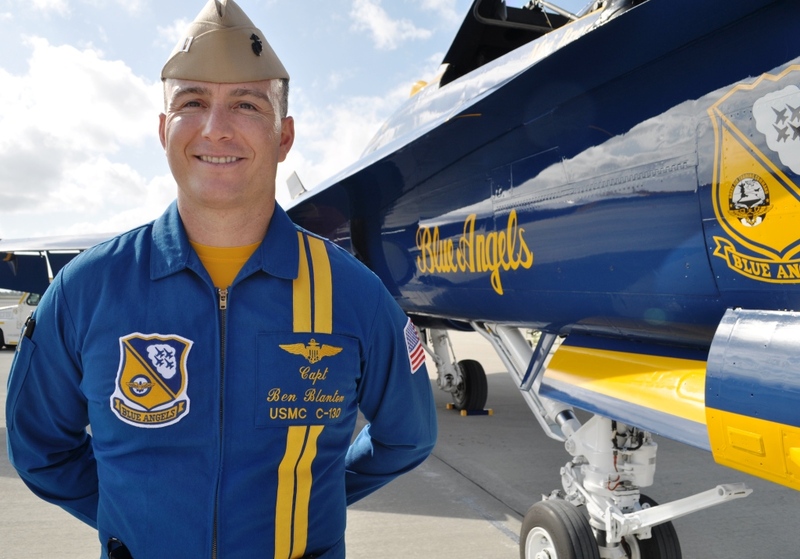 Blanton has been the aircraft commander of the U.S. Navy Blue Angels‘ C-130 for three seasons with this being his last year with the squadron. Established in 1946, the Blue Angels are the Navy’s oldest flight demonstration squadron. Their show is a refinement of tactics taught to all naval aviators. Typically, when they perform for the public it’s an hour-long demo. Annually, about 11 million spectators are wowed by the team during air shows. He further explained the Blue Angels fly the oldest jets. “When an airplane is just about done with [its] service life, it’s given to the Blue Angels.” Boeing F/A-18 Hornets are painted blue and gold and fly with the team for a couple of years or so. “Newest and best assets are out there on the carriers,” Capt. Blanton said. What’s even more incredible is in the 47 years the Blue Angels have been flying, they have never missed a show due to maintenance. I witnessed the squadron arrive and the precision they executed was something else. After they received their orders, they were off preparing for the next performance. Well, those of us on the ground watching their precision performances think they’re pretty special but in the eyes of the military, they aren’t special. 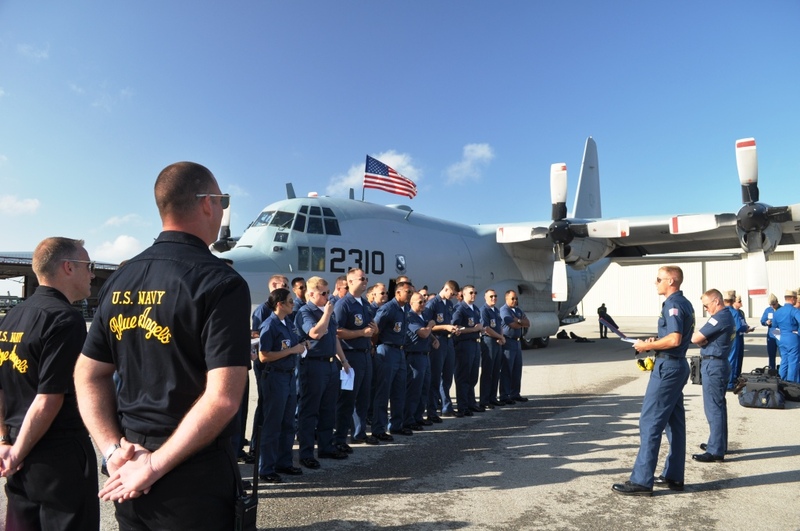 These are “sailors and marines hand-selected to come to the Blue Angels,” Capt. Blanton told me. In essence, they are international goodwill ambassadors representing half-a-million active duty marines and sailors deployed around the world. Following a two to three-year tour with the Blues, marines and sailors return back to active duty. 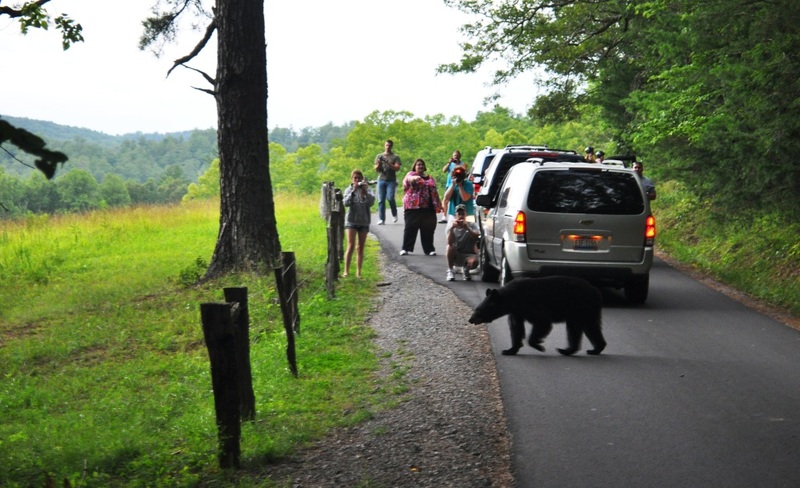 They don’t receive special compensation for being part of the Blues. Hey! Hey! Hey! It’s Fat Albert! Capt. Blanton was aircraft commander of the Blue Angels’ Lockheed Martin C-130 Hercules Cargo Plane, affectionately called “Fat Albert” because of its size and shape. And yes, it’s in reference to the 1970s Bill Cosby cartoon character of the same name. “Fat Albert” was out of commission during this mission to Punta Gorda but I saw its backup, “Ernie.” (As in, Bert and Ernie.) 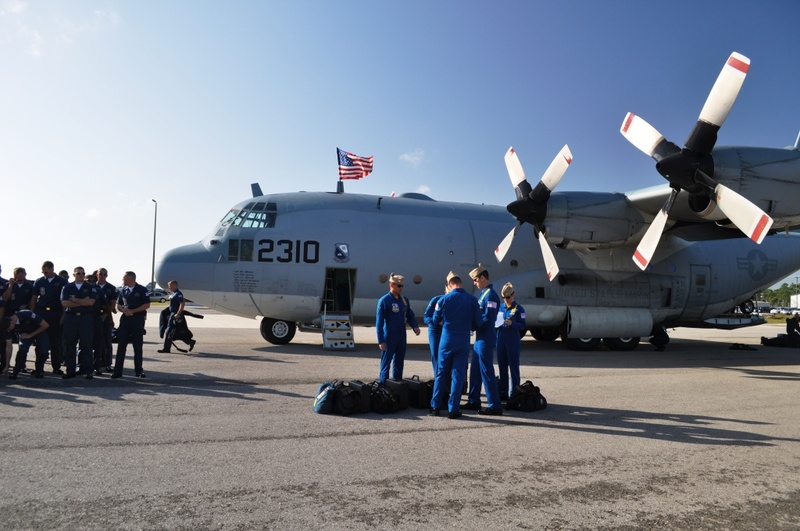 The C-130 is the squadron’s support plane and carries 35,000 pounds of cargo including tool boxes and spare parts. When I asked the next question, I inadvertently stuck my foot in my mouth and probably insulted him but he took it in good stride and clarified my misconception. I was under the impression being a jet pilot is what all pilots aspire to be but not so. Capt. Blanton selected to fly multi-engine planes, which is the C-130. As he explained, it’s a “pipeline” pilots choose when entering the military. Those who fly the jets chose the single-engine attack pipeline and may transition to similar aircraft but typically stay in that genre. Advice to Follow in His Path? The Blue Angles’ season is March to November with the final show being the Blue Angels Homecoming Air Show in their home base of Pensacola, Fla. (If you’re visiting that part of Florida, be sure to visit the National Naval Aviation Museum.) Visit the Blue Angels website to view their 2013 season schedule which includes a few performances in Florida. 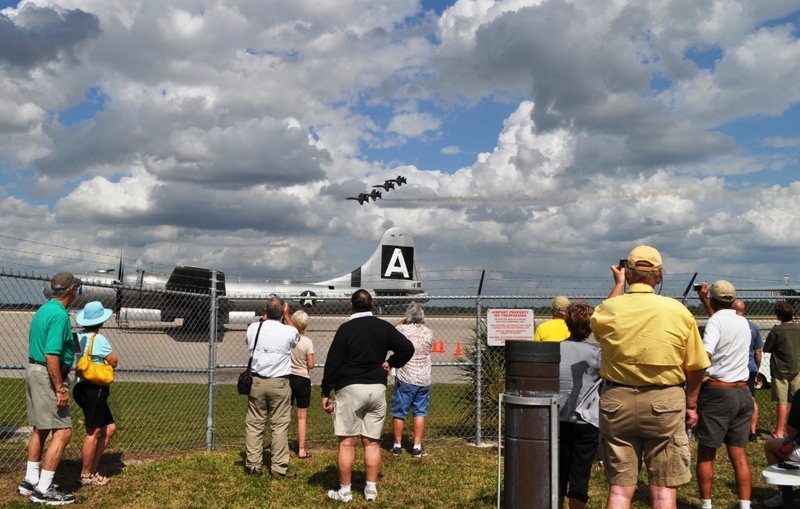 Although the Blues won’t be performing at the 2013 Florida International Air Show, save March 23 & 24, 2013, on your calendar for other amazing aerobatic performers, static displays and jet team performances. Visit the Florida International Air Show website for updates. Even if you’re not into aviation, seeing the Blues perform is a thrilling and exhilarating experience. They are recruitment ambassadors for the Navy and Marines and encourage our youth to dream big by demonstrating anything is possible. The Blue Angels are one of America’s treasures and deserve to be cherished.